Where's Salvon Ahmed? And what's up with all the shuffling around on the offensive line? The Huskies looked the part beating Utah on the road, but there are still some questions for 2-1 Washington to answer. On the one hand, it would seem odd to not highlight first the performance of the Washington defense. But then, the return of Myles Gaskin — of that Myles Gaskin — was probably the greatest development for the Huskies on Saturday night. Gaskin was never worried, of course. “Like I told y’all before … ” he said after the game. The Huskies believe they are built to take advantage of what a defense gives them, and the game plan in the first two games called for more passing — that is, Auburn and North Dakota were determined to stop the run. Against Utah, the Huskies thought they could establish the run and lean on Gaskin, and they did exactly that. Gaskin finished with 30 carries for 143 yards and a touchdown, and his ability to slip through defenders’ arms, to consistently fall forward for an extra yard or two, never ceases to amaze. He moved past Stanford’s Stepfan Taylor and into the No. 7 spot on the Pac-12’s all-time rushing list (now with 4,326 yards). His 30 carries were the second-most of his career; his career high was 32 in the 2015 Apple Cup, when he rushed for 138 yards and two TDs. As good as the defensive performance was — shutting out the Utes over the final three quarters — it was the way the defense did it that made it all the more impressive. It was, in a word, loud. The Huskies played an extremely physical game against Auburn, and Saturday night looked and sounded every bit the same. 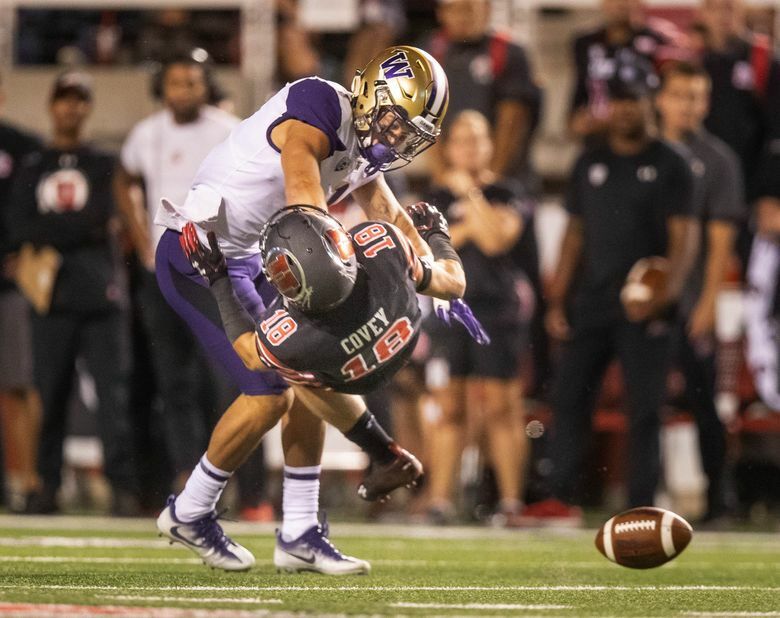 Say what you will about the two targeting ejections against Utah — neither seemed malicious, but they did appear to be the right calls from here — but in contrast to those helmet-to-helmet hits the Huskies had two monster hits notable largely because they were clean. They showed that a defender can play “hard-nosed” football without leading with their helmet. Murphy had a shoulder-to-chest smash to break up a pass. Ben Burr-Kirven had another one in which he shot through the ‘A’ gap on a designed QB run and hit Utah’s Tyler Huntley for a loss on third down. Speaking of Burr-Kirven, the middle linebacker had another 11 tackles Saturday night, giving him 33 overall this season, by far the most on the team. He’s had a spectacular start to his senior season. This isn’t to suggest that the offensive line had a bad performance — Gaskin would be the first to tell you he didn’t run for all those yards without help — but it is disconcerting that the Huskies again had to make significant changes on the line either because of injury (to center Nick Harris) or performance. Henry Roberts (at left tackle) and Henry Bainivalu (at left guard) both came off the bench for critical drives in the second half, the first time we’ve seen either of them take any meaningful snaps. Whether they were called on because of injury or performance related to Jared Hilbers and Luke Wattenberg wasn’t entirely clear. Coming into the season, the line was considered perhaps the strength of the offense. Now with Trey Adams out long term, with Harris banged up and with the sudden shakeup elsewhere, the line might be the offense’s greatest concern. Sound familiar? The sophomore running back had just three touches on offense, netting a total of 5 rushing yards, and at this point it’s fair to wonder if there’s a hidden injury that’s limiting him. What other good explanation would there be? True, Gaskin had the hot hand and why go away from what’s working there, right? And, true, Ahmed was on the field as a jet-sweep decoy on Gaskin’s 38-yard touchdown run in the first quarter. Beyond that, the disappearance of one of the Huskies’ premier playmakers has been one of the more puzzling issues early on this season. How serious is Nick Harris’ injury? The good news was Harris was back at center after missing the North Dakota game with an apparent knee injury. The bad news is he left the game in the second half Saturday night after appearing to aggravate the knee injury. No immediate word on the severity of the injury. What’s up with the punting game? Petersen has been vague about the availability junior punter Joel Whitford, who remains sidelined with an undisclosed injury. Walk-on Race Porter had seven punts Saturday night — all the rugby-style low line drives, which are by design. In the Petersen era, the Huskies have typically had one of the league’s better coverage units; they rarely allowed a return. But of the seven punts against Utah, five were returned by Britain Covey for a total of 77 yards, including a long of 28. The Huskies need to clean that up.